OOOH! Congrats on the Spotlight too! Well deserved. I should've waited for my order to arrive to make something too! You all are going to 'make' me go out and buy those new border punches. Those button birds make me laugh! Anyway (lol!)... I was just saying that I'm no expert, but those are the cutest aliens that I've ever seen! I really like that Summer Sunrise right now. Hmmm...Need to start my Aug PTI purchase list. :-) Are you going to CHA? Such cute cards, Heather! 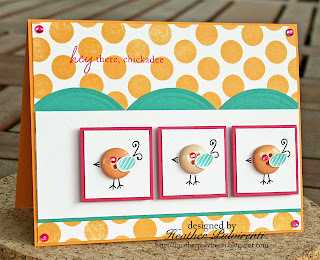 I just love the bird card! I love the colors! And I love love love your 2nd card! Your little button birdies are so cute, and your dimensional flower is gorgeous!! I love both of these, Heather!! Faby cards, Heather! Congrats on making Dawn's spotlight, too! Your birds DO NOT look like aliens!! It's adorable! The second card is gorgeous!! I'm so jealous you have your sets already!! Mine come tomorrow!! Beautiful cards!!! I love your alien birds!! 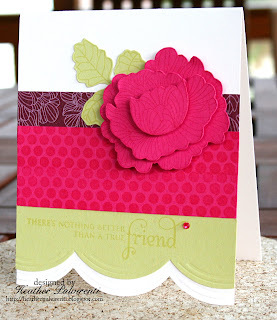 And your card for DAwn's challenge is totally gorgeous! These are both such beautiful cards! I have been stalking your blog for a month now. Your creative talent is so inspiring. I always find something to oooh and ahh over. These are just too cute! I love those birds! Congrats on the top pick for dawn's challenge! Awesome card!! I love that bird card, gotta get that set, too!! Congrats on Dawn's challenge! Woohoo!! Super cute cards! Have you ever made an ugly one!!! :) Anyhoo, really love the one with the birds! Too cute!